← Introducing the 2016 Anion Sailor Moon Crystal Cafe Menu! Oh, I agree! It’s a shame that things like this are lost to an English speaker, but on the other than, I’d rather read a NATURAL-sounding translation that one that gets pedantic about accuracy. Does it make sense to complain about discussion of gender and pronouns when it comes to a character whose gender and pronouns are a major topic of discussion? This was an interesting read. I would love to see a post about Fish Eye one day. For me they were always clearly transgender and I always referred to the character as ‘she’ however lately I’ve been rewatching SuperS and I noticed that Fish Eye uses different pronounce depending on how they want to appear to others. For example when Fish Eye is at the bar with the Amazon Trio or reveals their true identity to the victim I think they go by “Boku” and perhaps “Ore” (but I may be wrong here) but when cross-dressing they use strictly female pronounce. I’m not a fan of using ‘they’ but Fish Eye seems so non-binary that I no longer know can I just call them a ‘she’. Fish Eye is clearly transfeminine and androgynous but being transgender myself I just prefer to call them – her since for me she’s simply a transgender woman. I don’t think that’s what the creators were going for though. Probably just a cross-dresser or ‘otokonoko’ / ‘otoko no musume’. Japan is so open when it comes to cross-dressing and fluid gender identity but at the same time it seems they struggle with acknowledging a quite simple concept of transsexuality. Fish Eye is definitely an interesting character, and one of the instances where I feel like the anime did a lot more with him than the manga, probably due to having a lot more time to devote to each character. It also kinda feels like the anime used the Amazon Trio story arc as a kind of “holding pattern” while they waited for Ms. Takeuchi to develop the manga further (and move on into the Amazoness Quartet)… but that’s neither here nor there! I have to admit that I haven’t actually taken the time to listen to Fish Eye speak in the anime, but I’d definitely be interested in taking a look (listen?) to see how this was handled. Just going off perception (and with zero facts to back this up right now…! ), Fish Eye always felt to me like s/he expressed more masculine tendencies when ‘getting down to business’ (meeting with the victims, attacking the Sailor Soldiers) and was more feminine when in his/her day-to-day, relaxed, personal life. I’d definitely like to see how this theory plays out, though. Unfortunately in Japanese, people rarely use pronouns at all anyway, so it takes quite a bit of time of staring at the TV with a pen and paper in hand. =p Still, it’s fun! Again keep in mind that Fish Eye was an actual fish, and that there are some species of fish which are hermaphrodites. They can not be defined as being either male or female as they possess both male and female parts either at the same time or switching back and forth between the two genders over time to fit their needs for survival. I guess the question then is…can we identify what kind of fish is Fish Eye supposed to be? I know some people have said lionfish due to the spiky stuff, although lionfish are not one of these gender fluid fish. However lionfish are part of a larger grouping known as scorpionfish and indeed some other members of this group display the gender swapping/neutral nature. There is a lot to be said about the gender connection with Fish Eye being a fish, and I definitely want to take a further look at that a little bit later, when I actually move into the SuperS and Stars arc (shooting for… later this year, maybe?). Not only are there are there a not-insignificant number of fish which can be defined as either/or (or neither/nor) on the binary selection of gender, but there are some species of fish which actually can swap genders if/when they find themselves in a situation where there are too many fish of a single gender (and thus few possible mates). I don’t recall all the exact details, but if I recall correctly, the clown fish in Finding Nemo actually do that. In the manga, she really only appears to be male when she’s a student at Mugen Academy. Afterwards, she dresses more feminine once her gender is revealed. In the anime, she’s always wearing masculine clothing, even though she never seems to have any intention of pretending to be male. 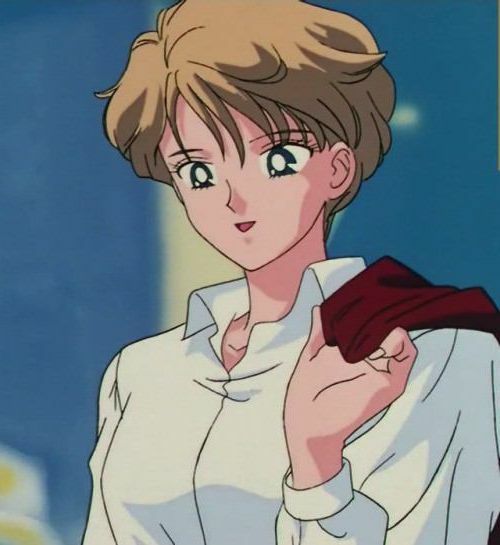 Although the Star Lights are often called the “transgender” characters, I would think that the anime version of Haruka is actually more transgender. Being masculine is more of her true nature, while the manga seems to indicate she’s more “fluid”. In that sense, the Star Lights would be “fluid” in the anime because they literally can become male or female at will. Thoughts? I’d love to comment on the Haruka, gender fluidity, and sexuality topic… but in my experience, these things are far too loaded with people’s personal opinions and beliefs, so I try my best to steer clear on this blog. Not saying that’d be you, but a quick look on online always opens my eyes to how toxic fan communities can be toward each other – especially in emotionally charged issues. As for the Star Lights! It’s always interesting to me that your perceptions change depending on how you choose to look at it. Do you think of them as Seiya, Yaten, and Taiki who turn into female Sailor Soldiers? Or do you think of them as innately the Sailor Soldiers who have taken on human forms? The way the Sailor Moon anime works as a series, the former should be true, but my gut instinct says that it should be the latter. Which I guess makes sense when you consider that these are Sailor Soldiers who supposedly never went through the death/reincarnation drama. They are definitely the Sailor Senshi who take on male human forms, for the sole purpose of finding their princess. Really, though, it shouldn’t have mattered if they were female singers. It’s interesting why they thought they had to be male (or in the manga, pretend to be male). Naoko-san, I believe, was not happy with the decision to turn them into males in the anime, because all Sailor Senshi are females. 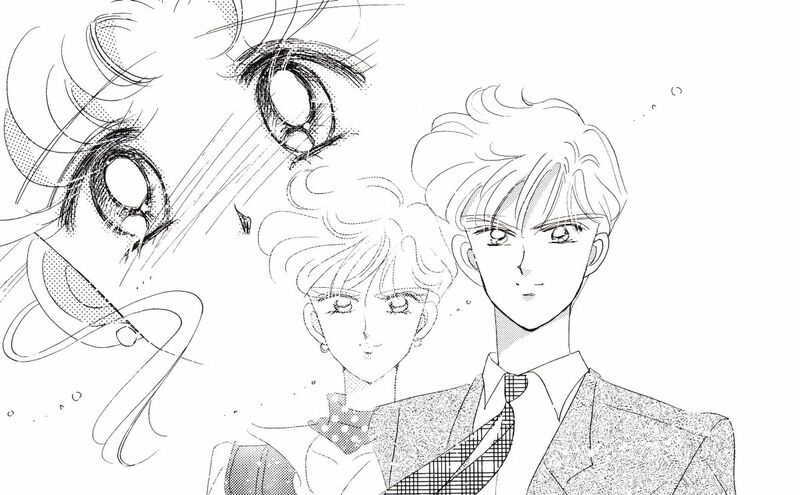 However, if we look at Codename Sailor V, and the first arc of Sailor Moon when Makoto first appears, both Minako and Usagi are able to use their transformation abilities to become male. So it’s totally possible for a female senshi to transform into a male! I guess my comment was that Haruka in the anime definitely had male preferences in her mannerisms, way of speaking, dress, etc. That was her “true nature”. In the manga, she pretended to be a male, because she could get away with it. Again, like you were pointing out, she was more fluid. In the fourth arc, a driver isn’t sure if she’s male or female at first. But does eventually catch on she is, in fact, a woman. Seiya (and, Ichiro, if I’m not mistaken?) confuse Haruka for a male in the anime, because of how she acts and dresses. So I guess I’m curious that the anime made her identify as male, and if she would be considered transgender, by today’s standards. Just something to wonder about! Yeah the tricky part is whether you consider Haruka in the manga to be using male pronouns in her civvie mode to be just normal procedure for her (which leans into the fluidity idea) all the time, or because the story *at that point* was still trying to be ambigious to the audience about her (in which case its a plot-based thing not a personal thing). IIRC people have picked apart that bit in the manga where Michiru has a private conversation with her and uses the male pronoun. OTOH, the pragmatic side of me wonders if things like Haruka becoming more overtly boyish in the anime is just a case of an adaptation just exaggerating a character’s most noticeable, unique traits. I used to joke the only reason Haruka seems to wear feminine clothes in the manga is Takeuchi prefers drawing that to men’s clothes, since even in the later myus that lean heavily into more mangaesque storytelling, Haruka was kept exclusively in guy clothes. Hi! I know this topic is over two years old, but I had a question for everyone. I was re-reading “Chibi-Usa’s Picture Diary Chapter 2: Beware the Tanabata”, and in this chapter (pages 5 and 6 I believe), Haruka is drawn wearing the Mugen Academy’s female uniform. I was just wondering if anyone had any theories as to why Ms Takeuchi drew Haruka this way, and not in the male uniform as usual? Have I missed something, and Haruka switched up her uniform in the regular manga? It’s a bit of a weird situation there. When you look at Naoko’s art book pictures, manga covers, mini posters, and frankly much of the art outside of the main story of the Infinity arc, Naoko often depicts Haruka in feminine clothes. So I’d say it’s not all that surprising that Haruka is wearing a female Juuban high school uniform in the manga.